1. I need to swing by MIT this upcoming Fall to buy a glass pumpkin. 2. Perhaps I should swing by Diablo Glass School and figure out if glass blowing is for me. Are you 21+ and interested in the art of glassblowing!? We invite you to join us for our upcoming wine tasting this January 28. 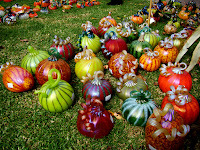 Come enjoy an intimate glass blowing demonstration accompanied by a wide selection of great wines and finger foods. Cheese and crackers along with thin meats will be served in our lounge. Escape the cold and cozy up to Diablo Glass School’s 2100 degree furnace. Our wine tastings combine fantastic wines and cheeses and interesting folks with a a glass blowing demonstration from one of our artists. Solo or joined by friends, cast those mittens and scarves aside to relax by our fire while being mesmerized by the ancient practice of glass blowing. One lucky onlooker will leave with a special Diablo glass treasure. This is a great way to warm up the winter and have some out of the ordinary fun; we hope to see you there! 0 Response to "Diablo Glass School Wine Tasting - 1/28"